We have been pretty lucky in the baby/toddler department; Baby K is amazing and we certainly don't deserve her! She has always been an excellent sleeper, we never knew when she was teething because she didn't get cranky or throw tantrums and she has been a great eater allowing us to introduce her to lots of different foods. But we have had to deal with lots of separation anxiety. Her crying whenever we have to leave her has caused me a lot of stress over the months. I don't think that her separation anxiety is entirely dependent on the fact that she is with me the majority of the time. Even when I worked full time and K stayed at Miss Gina's house with other kids, she would get upset when we left her at church. Luckily, K never got upset when we dropped her off at Miss Gina's! Of course, moving to a new town at an age when K was more aware of what was going on around her didn't help things. But that's our life and we are rolling with it. For the most part, Baby K is now really used to everyone at church and goes to the nursery with little to no hesitation (depends on the day). But when I have to leave her at MOPS, she has cried every single time. To be honest, the MOPS drop off has caused me so much anxiety because I really want my child to learn how to play with other children and to be ok away from me. Until yesterday!!!! I think I dropped off a different kid because Baby K walked into her classroom at MOPS without a single tear, kissed me goodbye and went on to play with her friends. Too bad yesterday was our last MOPS meeting of the year!!!! While we have by no means eliminated the separation anxiety, it is getting better. And if I'm being completely honest, I don't mind the fact that she is unsure of strangers. With the world as crazy as it is these days, I'm glad that my child is cautious and wants to be with mommy and daddy where she feels safe. 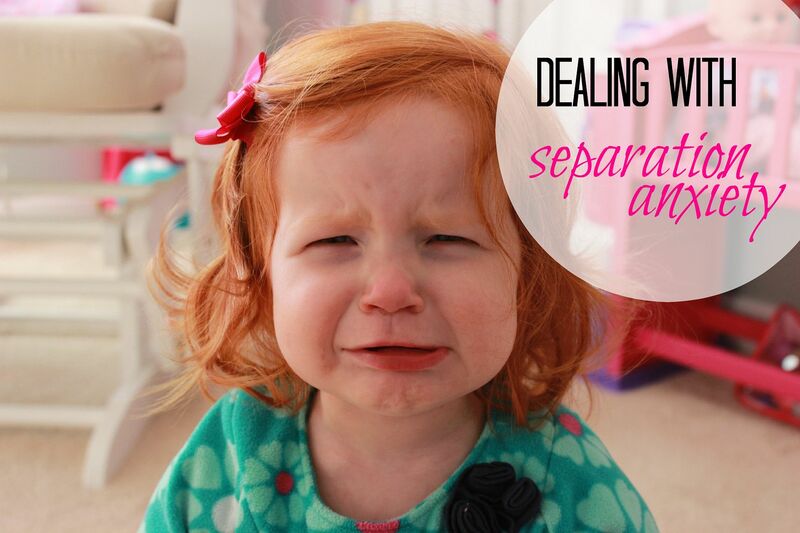 But for any of you who are struggling with separation anxiety, I wanted to pass along a few tips on what we do to prepare Baby K. 1.) Encourage your child to play independently. Until we moved into our house in October, I don't think Baby K ever played by herself (she was 16 months old then). There was always someone around: me, Tolar, Miss Gina, a grandparent, her cousins, aunts and uncles. But when we moved, I had to let Baby K play by herself so I could unpack and get us settled in our new house. Independent play has really helped her learn things on her own, grow her imagination and teach her that she doesn't need someone next to her 24/7. 2.) Talk about new situations with your child. Even if K doesn't fully understand what I am saying, I always tell her whenever we are going someplace new. We talk about who will be there, what she will do, what I will do and I always tell her that "Mommy always comes back." I repeat that several times during our conversation because I want it to click - I WILL be coming back to get her. I also tell her that "you will go home with Mommy when we are done." I typically have at least 3 conversations before we go someplace new: 1 the night before, 1 the morning of and 1 in the car. I repeat over and over that she will be just fine and that Mommy always comes back. 3.) Watch Daniel Tiger's Neighborhood. We love Daniel Tiger's Neighborhood in our house, because we are a musical family and the show has so many fun songs to help kids learn about new things. There is even a song called "Grownups Come Back" and we sing it a lot. This has been very helpful in getting Baby K to understand that I will be back to pick her up after church. You can click this link to watch a video with the song. 4.) Have a goodbye routine. I always try to do the same thing each time I drop Baby K off somewhere. Whether I drop her off at my mom's, at church, at MOPS, with my aunt, whatever. We hug, kiss, say bye bye and I tell her that Mommy always comes back. Come up with your own goodbye routine that makes your child feel comfortable. I used to hang around and try to calm Baby K down, but that only made things worse. Now I go through our goodbye routine and leave. Most of the time, your child will calm down, especially if you aren't there. Prolonging the goodbye just makes the child even more anxious and often causes a bigger meltdown. BUT ALWAYS SAY GOODBYE. DON'T SNEAK OUT. As hard as it is to leave your child crying in the arms of someone they don't know as well as you, you have to do it. It is healthy for a child to not be by your side all the time. They need interaction away from you and with other kids. As long as it is a safe place, your child will be taken care of. And it is healthy for you as the parent to have time away from your child. Do you have any other tips that you would add for parents dealing with this? I hope these help!!! I loved this article, you give a lot of great advice. My 3 year old son is with me 24/7 and gets very upset in the rare occasion O have to drop him off somewhere. I am nervous for preschool this fall and will try to use se of your tips!